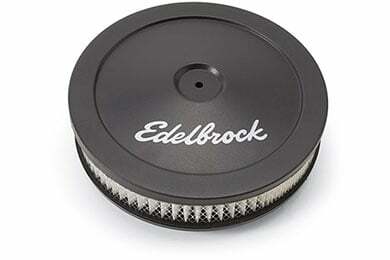 Edelbrock Pro-Flo Air Cleaner - FREE SHIPPING! Add style and performance to your ride with the purifying power of an Edelbrock Pro-Flo Air Cleaner. Available in multiple sizes and customizable alignments, this high-quality air filter improves gas mileage, horsepower and acceleration. Choose between chrome or black finishes. 1-year warranty. Absolutely unbeatable for the price! The matte black with red filter (and small white stripe) looks absolutely killer, and the fit and finish is exceptional. Received air cleaner quickly and appears to be of good quality. Fit perfect on my Chevy 4.3 liter TBI and the shipping and price were fantastic, thank you!!!! I really like the quality and look of the edelbrock air cleaner. Reference # 764-435-030 © 2000-2019 AutoAnything, Inc.